This Moroccan Carrot Salad is packed with flavor and healthy ingredients. 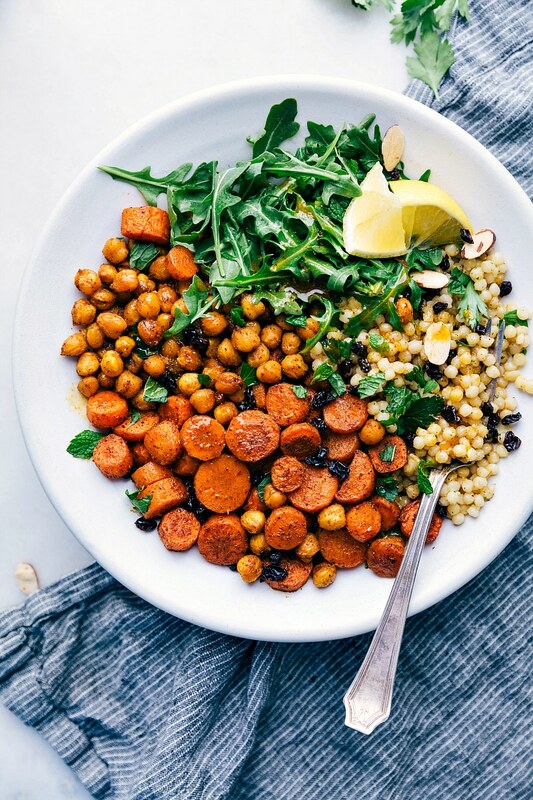 From the roasted seasoned carrots and chickpeas to the garlicky couscous and citrus dressing, every bite is a treat! The chickpeas and couscous make this salad super filling! While this salad can stand on it’s own as a meal, you can also serve it alongside some grilled chicken or grilled steak. This salad is simple to make, can be made ahead of time, and stores well (great meal prep) if made in advance. While I’m not sleeping through the nights super consistently, I tend to crave sweets constantly! (These snickerdoodles or chocolate muffins come to mind.) To avoid eating sugary treats for breakfast, lunch, and dinner, meal prepping is a must for me. And while I don’t mind eating the same thing for 3-4 lunches in a row, I do need variety week to week! Besides variety, the meals also need to be quick and easy to make, still taste great by day 4, and have generally healthy ingredients. Enter: this Moroccan Carrot Salad. This salad a meal prepping dream come true! OR if you’re not into meal prepping, it makes for one heck of a main dish salad! 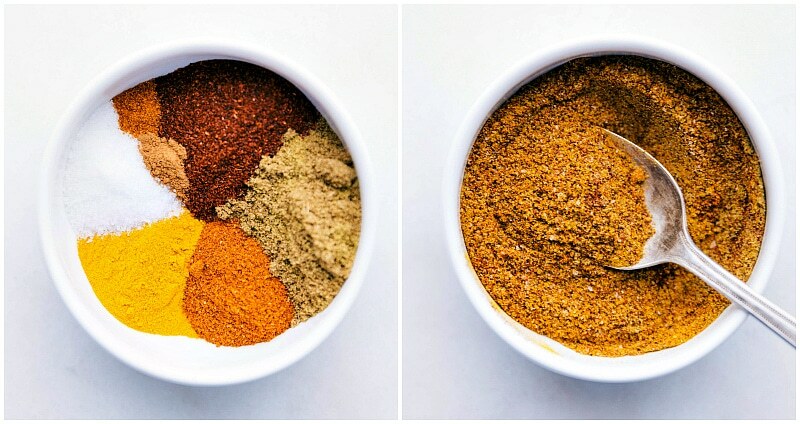 Make the seasoning mix: start by combining a few seasonings in a small bowl. This seasoning mix will get used to flavor the vegetables, chickpeas, couscous, AND the dressing! 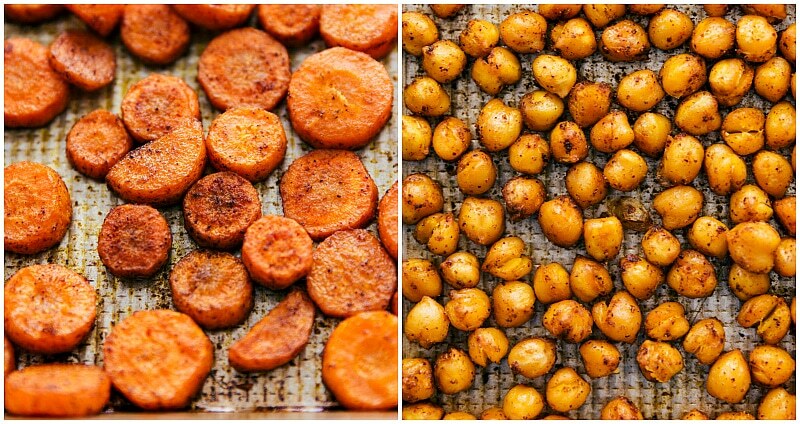 Roast the carrots and chickpeas: add the carrots to one tray and chickpeas to another tray. Toss the carrots and chickpeas with some of the seasoning mix + olive oil, and roast in the oven. Shake together the dressing in a mason jar: add some of the seasoning mix, orange juice, lemon juice, and olive oil to a mason jar. Shake to combine! Make the couscous: follow package directions to cook your couscous (which is SO fast to make!) and add the last bit of the seasoning mix. Assemble: Either separate ingredients into meal prep containers OR add them all in a large salad bowl. 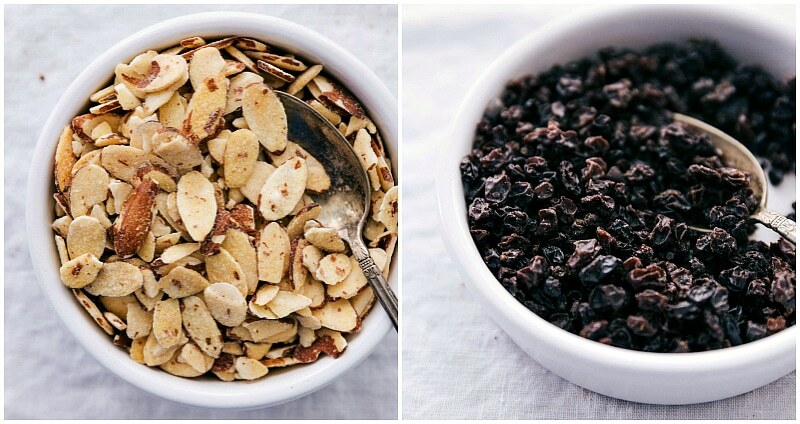 Add the salad toppings: roasted almonds, dried currants, and fresh herbs. Enjoy with the dressing! Now that we’ve talked about making this Moroccan carrot salad, you can serve it right away OR meal prep it. Grab 4 equal-sized meal prep containers, and 8 small containers for the dressing/salad toppings. You’ll want to store the dressing, almonds, and currants separately to avoid the salad getting “soggy.” You can buy bulk dressing containers, use dressing-sized Tupperware containers, or use small snack-sized plastic bags. Prep the recipe according to directions. Add couscous to one side of the container, roasted carrots and chickpeas in the center, and the dressing + salad toppings in the small containers in the last side of the meal prep container. Add fresh herbs daily or store in individual ziplock bags. To enjoy each day: add the dressing, almonds, currants, and fresh herbs on top. Stir everything together and eat! Make this salad your own! Cauliflower: we’ve tried this salad with using about 4 cups cauliflower in place of some of the carrots/chickpeas (still added oil, seasoning, and roasted them) and loved the addition! Honey roasted almonds: while plain or toasted almonds are delicious, these honey roasted almonds add SO much to this salad. I’m obsessed with this addition! Yogurt: add some plain yogurt if you want to add a creamy element to this dish. Greens: the arugula is great in small quantities, but the salad is also delicious without it – your choice on adding! Same with fresh herbs — add parsley and/or mint (even cilantro if you want) to your desired preference! Currants: I use zante currants in this Moroccan carrot salad (found right next to raisins in most grocery stores) but you can use chopped up dates instead. 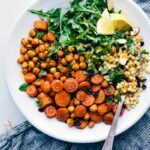 How long does moroccan carrot salad last? This salad will stay good (without dressing added) for up to 4 days when refrigerated in an airtight container. This salad does not sit well for an extended time period with the dressing on it. Preheat the oven to 400 degrees F. Position oven racks to the middle two positions. Toss together the seasonings: chili powder, cumin, ground turmeric, garam masala, salt, ground cinnamon, and cayenne pepper in a small bowl. Stir to combine. On one large tray, spread out (even layer; avoid overlapping) the drained, rinsed (and completely dried) chickpeas. Add 2 tablespoons oil and 1 tablespoon of the seasoning mix. Toss to coat. Peel carrots and slice into 1/2 inch rounds (cut large rounds in half to form moons) On another large tray, spread out (even layer; avoid overlapping) cut carrots. Add 2 tablespoons oil and 1 tablespoon of the seasoning mix. Toss to coat. Place carrots on the higher oven rack and chickpeas on the rack directly below. Roast for 15 minutes and then remove both trays, stir/flip chickpeas and carrots and return to the oven for another 12-18 minutes or until carrots are crisp tender and chickpeas roasted. Remove and set aside. While veggies are roasting, prepare couscous according to package directions. In a mason jar, add in the olive oil, lemon zest and juice, orange zest and juice, honey, and 1 tablespoon seasoning mix. 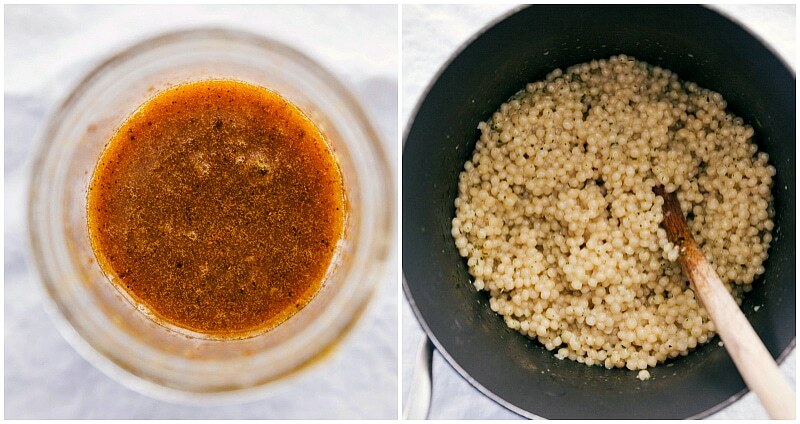 Add any leftover seasoning mix to the cooked couscous. Put lid on mason jar and shake dressing to combine. 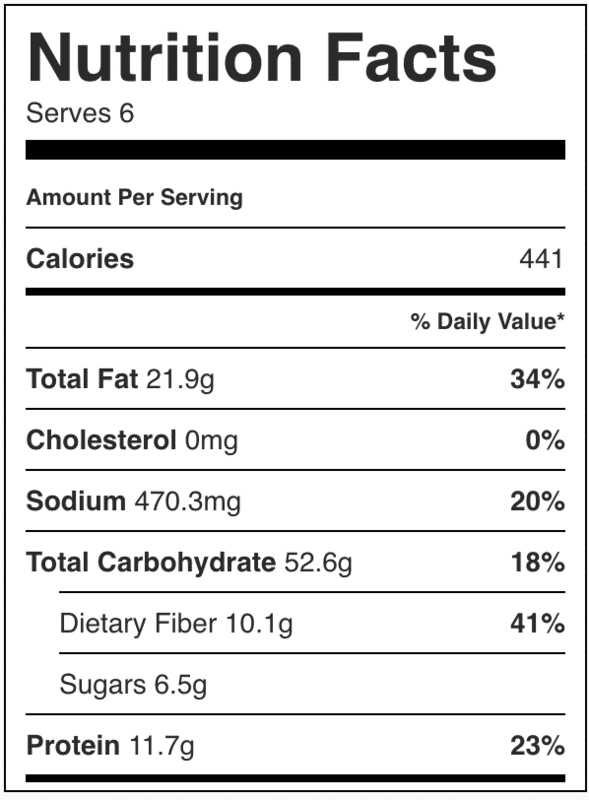 Taste and add additional salt if needed. To serve: Add couscous to a large bowl. 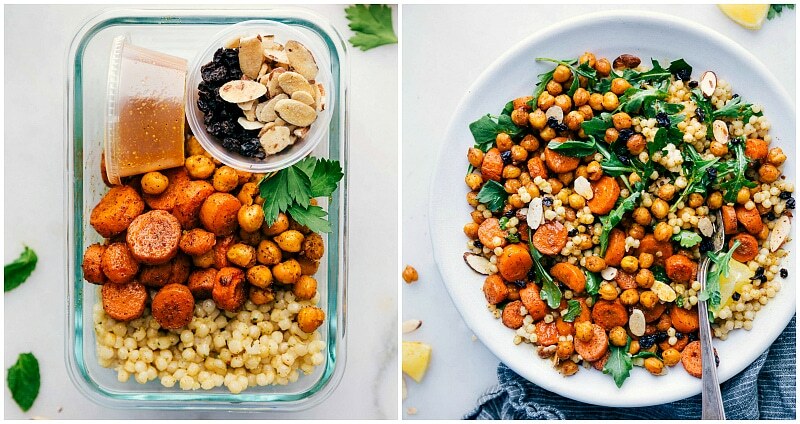 Top with roasted carrots and chickpeas. Toss with dressing*, almonds, and currants. Add fresh herbs and/or arugula to desired preference and enjoy! To meal prep: see blog post for meal prepping instructions. *Only add dressing, almonds, currants, and fresh herbs to the salad that will be eaten that same day. This salad doesn't sit well for multiple days with the dressing. Thank you so much Tina! 🙂 Oh that is perfect! When I made these with cauliflower, I actually cooked it the same time as the carrots — about 25-30 minutes (relatively small cut florets). Hope you love this salad! I’m eating this right now. Wow. I didn’t even do any of the add-ins…just the basic carrot, chickpea, and cous cous mixture over some greens with the dressing and it’s so good. It’s hard not eating half the sheet pans’ worth in one sitting. Thank you! Had everything on hand except the currants and almonds – so I used raisins and chopped cashews. I recommend adding a few raisins to the cous cous as it cooks – they get rehydrated and delicious! I also used plain bulk cous cous + 1 tbsp of the spice mix since I find those packets wayyy too salty. 1.5 cups dry was enough for 4 meals.